We see a trend today occurring with publishers large and small: increasing the amount of video in your content library increases aggregate views of all video. And if my understanding of Web economics is even remotely correct, publishers are definitely looking to increase views and viewership. To make it even easier for our publishers of all sizes to rapidly scale their online video libraries, we are excited to introduce the Brightcove Content Exchange, a new initiative that makes large libraries of high quality video content from our partners accessible to our customers using the Video Cloud online video platform. I’ll discuss the Content Exchange in more detail below, but let me first give you some context behind this new initiative. It’s not difficult to understand why more content leads to more engagement and success. If I have one video on my site, a viewer will come, watch that video, and then leave. If I have two videos, and I make it simple to watch the second one after the first one ends, then that same viewer is likely to watch both videos--effectively doubling the number of views. Of course, that second video might not be as interesting to my hypothetical viewer as the first, so I need to present more than one option to assure that second view. As my library expands further, I am able to present an increasing amount of relevant content to that same viewer, keeping them on the site longer, and encouraging them to watch more video and, of course, advertising. Because advertisers place a higher value on engaged consumers, all of these new ad impressions I’ve created can potentially be sold at higher CPM. Not only have I increased total available ad inventory, but I’ve also increased the value of every ad I sell, and by extension increased the value of my video investment as a whole. 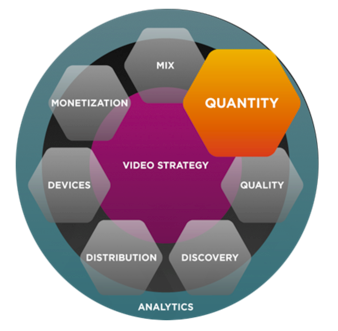 Brightcove represents this need for content in the Quantity facet of our Video Strategy Framework (VSF). Very simply summarized: more video leads to more viewers, more engagement per viewer, and ultimately increased ad revenue. Anyone who takes this idea to heart should now be wondering, “how on Earth am I going to get all this content?”. The Brightcove Content Exchange initiative is designed to help answer that. But first a quick discussion on content economics. There are many sources for content - what the VSF refers to as Content Mix - and it’s important to consider the financial implications surrounding each kind. Video that is produced in-house, whether live, or on-demand has many advantages. First off, it is unique and typically can be found nowhere else. You also control the production quality, and can therefore make it perfectly match your standards. Because of these two facts, this kind of content commands the highest advertising rates. But it can also be expensive to create. Very expensive. On the other end of the spectrum is content you get from your audience: User Generated Content. UGC video can be acquired by running contests, soliciting users for their “story” as it relates to your product or service, video mash-ups, etc. As a result, costs for acquiring UGC are comparatively low. But the down-side is that the quality is varied, the content itself can be questionable, and each piece must be vetted for appropriateness. Ultimately, effective CPMs on UGC video is fairly low. In between those two sits what I like to call Partner Content. These are videos from partners that either produce their own content in-house and/or license the right to distribute a wide variety of video. From an economics perspective, partner content makes a ton of sense. It is usually available on an advertising revenue-share basis, which means there is little or no up front cost to run it (like UGC), but it’s also professionally produced and curated, which means it can command higher CPMs (like in-house content). If you could include partner videos alongside your own content, you would be able to easily deliver that elusive “next” video to keep your viewer engaged longer. This is precisely the goal of the Brightcove Content Exchange. The Brightcove Content Exchange brings together a select group of Brightcove partners with large libraries of high quality video content, including AOL Video, Diagonal View, Internet Video Archive, NewsLook, ScreenPlay, Inc. and Touchstorm. These partners have stocked their Video Cloud accounts with broad libraries of video content across hundreds of categories and topics--about a half million total videos so far. Those videos can then be made available directly from within a customer’s Video Cloud account through our unique Media Sharing feature, enabling the content owners to retain essential controls while giving publishers the ability to determine how and where the content will be published. In short, the Content Exchange helps our customers expand their video libraries quickly and without headaches, while also making it easy to monetize this content and increase the value of their online video business. To learn more about the Content Exchange, I encourage you to download our new whitepaper, “Increase Quantity to Build Your Online Video Success”. You can also join me for a special Content Exchange webinar on March 28th at either 9:00 am ET or 3:00 pm ET.